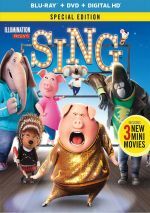 In the same vein as 2016’s Sing, 2017’s Rock Dog looks at anthropomorphic animals who desire to become musical stars. Young mastiff Bodi (voiced by Luke Wilson) lives in the Tibetan village of Snow Mountain, a place where his father Khampa (JK Simmons) serves as town guardian to protect from wolves. Khampa expects that Bodi will take his job when he retires, but the younger canine seeks a different path. After a radio falls from the sky, Bodi becomes fascinated with rock ‘n’ roll and decides he wants to pursue a career as a musician. Though I alluded to Sing at the start, I can’t call Rock Dog a rip-off of that hit. 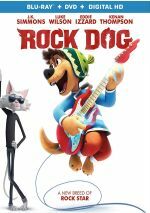 A Chinese-American co-production, Rock Dog hit screens in Asia more than half a year before it came to the US, so it actually preceded Sing’s release date. Also, other than their basic connections to music stardom, Sing and Rock Dog don’t have a lot in common. Instead, Dog feels a lot more like a spin on another animated franchise: Kung Fu Panda. Though Dog goes for a narrative reverse. In Panda, our hero led a creative life but dreamed of action heroics, while in Dog, Bodi wants to shun his role as fierce guardian to focus his energies on musical endeavors. And thus ends the semi-clever aspect of Dog, as beyond that minor twist, the movie fails to offer much to endear it to an audience. In the midst of big-ticket animated fare from studios like Pixar and DreamWorks, we get the occasional flick like this: budget work that hits screens with low expectations. Though Dog violates some of those traits, partly because its $60 million budget isn’t peanuts. No, it doesn’t compare to the $100 million-plus some “A”-list films cost, but it’s not quite “low budget” territory, either. Dog also comes with higher than usual expectations due to the presence of writer/director Ash Brannon. A veteran of the Pixar ranks, Brannon co-directed 1999’s Toy Story 2 and wrote/directed 2007’s Surf’s Up. With Brannon in charge, I figured Rock Dog might work better than the usual generic animated material. Nope – everything about Rock Dog feels simplistic and flat, with little inspiration on display, and that becomes a disappointment. Toy Story 2 qualifies as a legitimate classic, and Surf’s Up delivers a quality experience as well. Rock Dog lacks one-tenth of the creativity involved in either of Brannon’s other films, and it never threatens to break out of its doldrums. The story feels contrived and never especially convincing, so we don’t invest in Bodi or his journey. Really, the movie often seems like little more than an excuse for a mix of musical sequence. The flick packs in a lot of tunes, and these can be tail that wags the (rock) dog, as the film too often appears to lack much other purpose. The film’s relatively low budget shows via its weak animation. The visuals don’t match up with 2017 standards for CG cartoons, so the results come across as unnatural and unconvincing. Dog gives us a pretty good cast, as along with Wilson and Simmons, we get talents like Eddie Izzard, Lewis Black, Sam Elliott, and Matt Dillon. None of them overcome the bland nature of the material, so they fail to add real spirit to the proceedings. At its worst, Dog delivers passable entertainment, but that’s also what it does at its best. In a world packed with quality family films, “passable” doesn’t seem like much of a recommendation. Rock Dog appears in an aspect ratio of approximately 1.78:1 on this Blu-ray Disc. The image looked solid. Much of the film opted for a chilly blue feel, though the palette opened up fairly well when necessary. The movie showed these colors in a vivid manner. Blacks seemed dark and deep, while shadows appeared smooth and clear. Everything about the transfer pleased. Though not bad, the movie’s DTS-HD MA 5.1 soundtrack seemed less impressive. This was because the soundfield often lacked much ambition, though it did kick to life at times. Some fireworks used the channels well, and a few other action-oriented sequences boasted pretty useful material. Music also spread across the speakers in a vivid manner. These elements led to a sporadically involving soundscape. Music was perky and full, while effects appeared accurate and packed a nice punch. The erratic nature of the soundfield left this as a “B” mix. Four featurettes fill out the set. Finding the Fire goes for six minutes, 17 seconds and offers info from writer/director Ash Brannon, co-producer Benjamin Gilberg, creator/executive producer Zheng Jun, producers Rob Feng and Amber Wang, and writer Kurt Voelker. We learn about the source novel and its adaptation as well as story/character areas. Despite its brevity, “Fire” includes a few good notes. During the six-minute, six-second Mic Check, we hear from Brannon, Gilberg, Wang, casting director Jen Rudin, and actor Lewis Black. Here we get notes about cast and performances. I like the shots in the recording studio, but otherwise “Mic” lacks substance. A Rockin’ New World lasts five minutes, 53 seconds and involves Brannon, Gilberg, Wang, production designer Elad Tibi, and character designer Matthew Bates. This show looks at visual design and animation. “World” gives us a short but moderately informative piece. Finally, we go to Exploring the Music, a six-minute, 21-second piece with Brannon, Gilberg, Wang, composer Rolfe Kent and singer/songwriter Adam Friedman. This show examines the music’s songs and score, and it does so in a reasonably engaging way. We also get a music video for “Glorious” by Adam Friedman. The video just mixes movie clips with large onscreen lyrics. It’s a boring clip for a mediocre song. The disc opens with ads for Middle School: The Worst Years of My Life, Leap!, Norm of the North and Shawn the Sheep: The Movie. No trailer for Rock Dog appears here. A second disc provides a DVD copy of Rock Dog. It includes the same extras as the Blu-ray. Although I’ve seen less entertaining animated efforts, Rock Dog fails to boast much imagination or spark. The movie ambles along in its genial manner but never makes a dent. The Blu-ray offers excellent visuals along with fairly good audio and mediocre supplements. While the film might work for an under-10 audience, it doesn’t spread its appeal to a broader demographic.